The Kuni family are some of the most feared and enigmatic shugenja in all of Rokugan. Kuni are very often skilled in the arts of the physical form, understanding anatomy and the mixture of the five elements in the body. Their training generally is steeped in biology and constuction of the living form. Their magic tends towards wards and bindings, either holding bodies in a location or preventing bodies from entering (or leaving) a place. 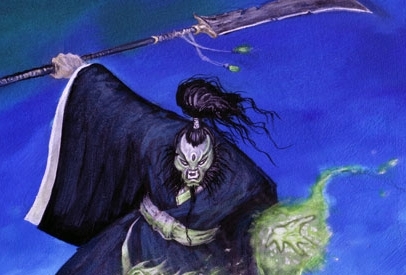 The concept of a spirit possessing a body is of great interest to the Kuni and, as the oni are spirits made flesh, they are even more interesting. Each Kuni has a part of the family library in their care, the system has it's advantages and disadvantages. Exchanging knowledge between two shugenja can be difficult and few shugenja have an all-encompassing mastery of the school. It is, however, difficult to destroy any significant portion of Kuni learnings. They hold annual meetings in Kyuden Hida every winter behind closed doors to discuss their findings over the past year. The Kuni Witch Hunters came about after Iuchiban attacked Rokugan. Also known as Tsukai-sagasu, they study the martial arts of their fellow Crab as well as the magical arts of their family. After their training is complete they set out to destroy the Shadowlands in any form they find it. Most travel north into Rokugan to search for Shadowlands creatures that might have slipped through the wall. They have no physical school, instead teaching their students directly and only one or two at a time. Their students are very often close relatives. They go to great lengths to understand the creatures of the Shadowlands, including capturing live specimens to study and dissecting dead ones. The tragedy of their scholarly pursuits is that members of the Kuni family are the most susceptible of all Rokugani to succumb to the Taint. The retaking of Kuni lands after their destruction by the army of The Maw left the land known as the Kuni Wastes. Retaking the Kuni Wastes in the years following the assault by The Maw wasn't easy. The Kuni launched into a ruthless campaign to retake their lands. The trees, plants and soil had been warped beyond recognition. Reclaiming it involved destroying the lands spirituality completetly, then rebuilding from nothing. The Shadowlands Taint was pushed back, but it left the land to wither and die, and nothing was able to restore the elements to their earlier harmony. The lands became a blasted waste of rock and sand, everything scorched and flattened. The plains stretch out, blowing sand and cracked mud as far as the eye sees. Most of the trees are long gone, only a couple of huge dead ones remain. This causes the Kuni to have a weakened elemental harmony, but by using spiritual ley lines connecting each shugenja's dwelling to others nearby they are able to continue their research and cast spells as other shugneja of Rokugan. The Kuni have been scattered far and wide, occupying ruins and rebuilding new dwellings. They will tolerate travellers in their lands as long as they are left alone to their studies. There are rumours that the Kuni experiment on captured oni, the occasional unnatural screams echoing across the wastes make the rumors more credible.